3D printers have been around for a while now. From the very beginning it's possibilities and future consequences have been something truly fascinating to follow. And while the technology keeps on improving the market of DIY printers keep following that trend. The resolution or quality of these prints remains a culprit or rather an obvious element that cannot be denied, you don't need a magnifying glass to spot the layers of plastic. The printing of a digital, mathematical perfect 3D model results into a low quality, yet tangible object. There's something about tangibility, the materialization of concepts remains, not per se a necessity, but rather a welcome extra, for our brains. Much like the need to print a text to spot the errors. While we wait and see where this 3D printing technology will lead to, we've made an image, a sculpture of a man sitting, waiting for 'it' to happen. 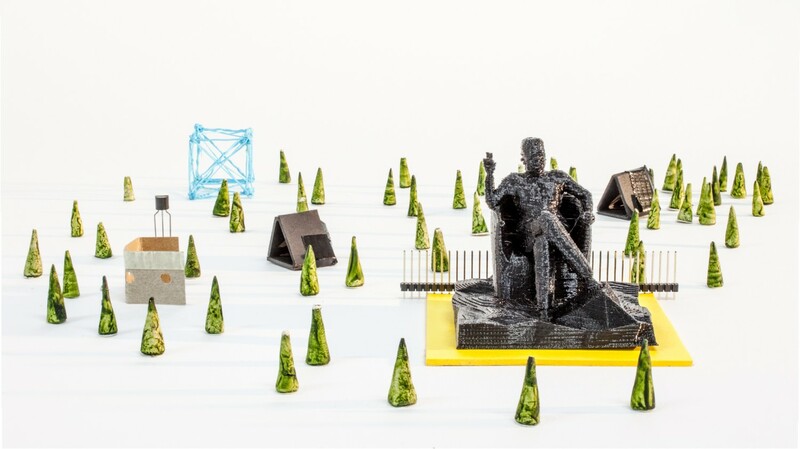 He sits as a statue in the park, a park composed of Post-It's, electronic components, ..., an analog compensation of digital imperfections.